This listing is provided as a service to 125 owners and prospective owners. We take no responsibility for the boats advertised below being available or in good condition. If you want to buy or sell a 125, or any parts for them, Click on the Add button below. It will be listed for at least 6 months and there is no cost involved. You are welcome to re-list if your item is deleted after the 6 months. If any of these listings should be removed you can Send a Message. '3195' Going Gonzo is for sale. 3rd in 2014/15 WA state titles. Happy to help organize intestate shipping at buyers expense. Comes with trailer & SS beach dolly. Includes almost new Irwin sails, and possibly two sets of spare sails. Fully rigged for racing and ready to sail. All currently stored dry in the garage. Complete except for missing some minor cheap items: 2 wheels for the SS dolly, and the hitch-bolt for the trailer. I can also include other accessories in the sale if you want them, though they may not suit this boat, e.g. life-jackets, anchor, outboard-motor, flares, and maybe other bits like spare rigging. Selling for best offer. Contact me to inspect or make an offer. Tic Tac is a quick fibreglass hull and has been sailed in Brisbane for the past 2 years. This Botterill boat was built in the mid 90s, was recently refitted and repainted 2 years ago and is a solid and dry hull. It has been well maintained and stored out of the weather. This well performed Bottrill Fibreglass hull is now for sale as my son Charlie has moved onto 29ers and his little sister is not showing any interest. In the rights hands it was capable of a top 10 State win if you read through the results, and i'm guessing i purchased it in 2010 as it hasn't taken a hooter since then. I will upload a photo once i learn how to save one, done now. Other photos can be sent from my phone if needed. Best way to get hold of me is by the mobile phone number, as i don't control the email address. I can send further photos via txt if required. Swish is up for sale. I am selling it as I cannot see it getting on the water in my hands. It comes with 2 sets of sails, a good boat cover and a trolley. It has everything you need, no work is required to get it on the water. Sadly I need the space in my garage so I'm selling my 125. Fully sanded back and ready to paint. Good condition. Comes with sails (no main sail), mast and trailer. Not registered. Will also supply trapeze harness. Well maintained and cared for. Inspection available at any time, even a sail on Maroochy River. The beautifully built and finished 125 is a competitive boat with foam sandwhich Boterill hull and timber decking/tanks all in very good condition. Decks, tanks and gunwhales are finished in 2 pack marine polyurethane for easy care. Bilateral rigging controls in cockpit, well set up for trouble free racing. Thompson racing sails, main, jib, spinnaker. Plus spare set. New mast 2012. Placed 8th overall and first on Handicap 2015/16 National Championships. Owner working shifts and studying and sad to say goodbye. Includes aluminium beach trolley in vgc, stainless axles, fits standard 6x4 trailer with beach wheals on. Trapeze harness included. Ready to race. •	Shed stored at NYC throughout its life. •	Boat, all fittings and rigging in very good condition. •	Sails in fair-good condition. Main sail and jib in excellent condition! Located in Qld but can post anywhere in Australia. Fitted out for competitive racing with easy to access central control lines. Spinnaker chute for easy work, comes with beach trolley and a complete set of sails. Purchased 2 years ago and sailed only a handful of times at Altona. Comes with a full set of hardly used Irwin sails and is well kitted out with quality fittings and sheets etc. Comes with a sturdy beach trolley and is ready to race. Kids trapeze harness (suit up to 14 years) also available. Centerboard wanted. Used in fair condition. My current one has a twist & maybe beyond repair. 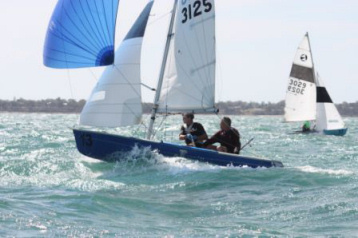 we have a new Formula Sailcraft MK2 125 for sale. Built as a family racing boat prior to moving , however we have other interests up here and never use it. Boat has been launched once but never been raced. It has brand new Irwin main sail, and old Thomson jib and kite. Boat has some unique extras..... Hand made fully adjustable carbon spreaders, saving nearly a kg of weight. It has an A Class rudder foil and carbon cleat brackets. Boat is on weight, not under weight as it has a stiffer glass bottom as I wanted this in the build to give it longevity. Includes formula Sailcraft trolley and road trailer with brand new rims and springs. Boat hasn't even been sign written yet. More info to come, (need to get photos and inventory of sails together) but just naming we are selling "Little Dashie", glass hull, wood deck, good condition- formerly sailed at spyc. The added value is a fully licensed quality trailer, and jinker. Totally refurbished wooden 125 and mast only. unregustered.I did it up for the grand kids but they are not keen to sail. Has no sails, no boom and no rudder. Great entry level boat has new center board and some new fitting. New 125 Race Model from the 'FS 125 Mk2' moulds which have produced the 2008/09 and 2009/10 National Champion 'Mk 2', the 2010/11 National Champion 'Greenout' and the 2011/12 National Champion 'Black Beard' FS Mk2s also placed well in the recent 2012/13 Nationals with 'Green Out' 4th, 'Kraken Up' 6th and 'Strange Magic' 7th. Our 125s perform well in all conditions and are carefully constructed in vacuum bagged foam sandwich with a tough gelcoat finish for long life and low maintanence. Priced from $8400 for hull/deck ready for fitting out, including scupper cut-outs, bailer recesses and floor grip. We also make foils, rudder boxes, alloy trolleys and can do full fitouts if required. We are the Australian distributors of the high quality UK Allen Brothers range of fittings and can supply quality Allen fit-out packages at very competitive prices. Also see our new on-line store: www.dinghyshop.com.au for all your dinghy sailing bits and pieces, Allen, Riley, Ronstan, English Braids Rope, SS fastenings and more. For more info, see Formula Sailcraft. Built from Divinicell foam and Vinyl-ester resin using vacuum infusion. Includes centrecase trunk built in. Ready for home completion of internals using either plywood or foam sandwich. Standard colour White, other colours available for $80.00 extra.